There is an element of risk involved in executing any project in the world. The trick lies in correctly identifying the same. These risks naturally would affect the performance of the project. The degree of severity may vary. The efficiency of the project lies in identifying as well as taking steps to mitigate the risks. Documenting the risks is very important. These Log templates would help you to do so. Any program could have some risks attached to it. This document in question lists out the identified risks. Each of the risks has an explanation in detail. It also contains the likelihood of the materialization of the risk as well as the severity of its effects. You may also see Mileage Log Template. 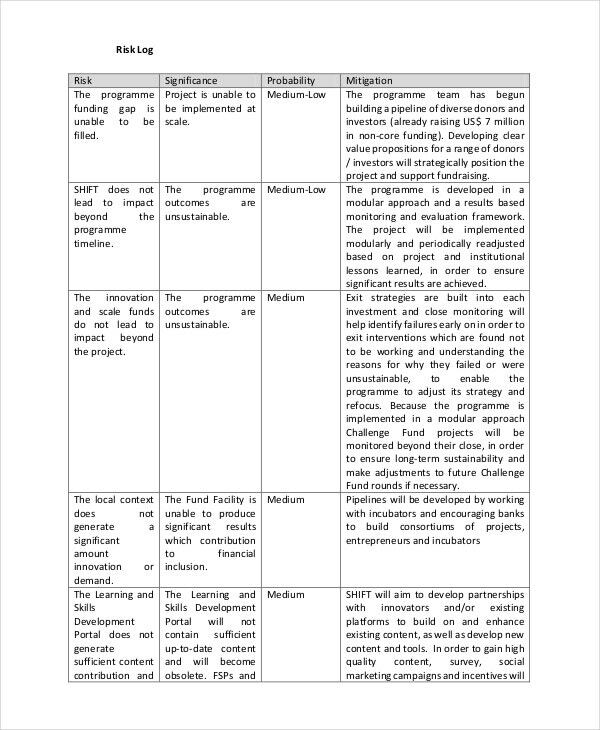 This document lists out the risks involved in any project along with their description as well as the countermeasures one should take to mitigate them. 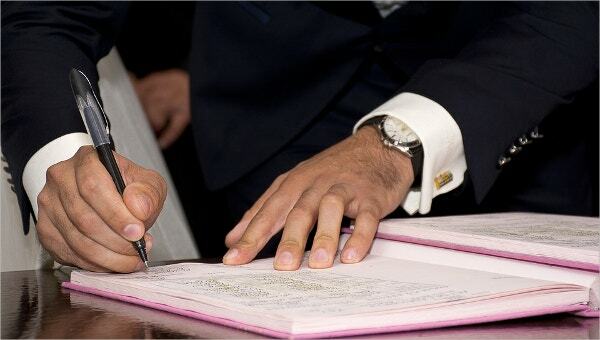 The document also enumerates the probability of the risks as well as the impact that they could have on the project. 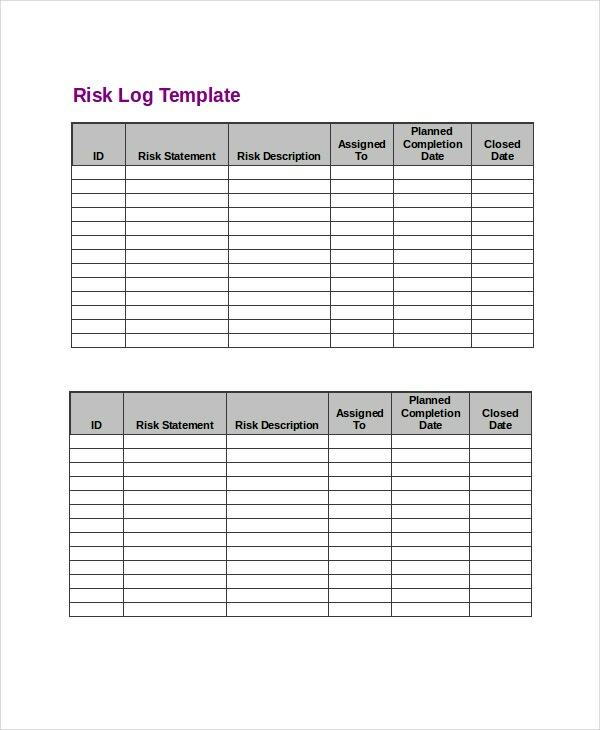 This document template is a Risk Management Log template detailing the identified risks. It also includes the impact of the risk as well as the measures one should take to mitigate the same. It gives information about the original exposure as well as the current exposure status of each risk. 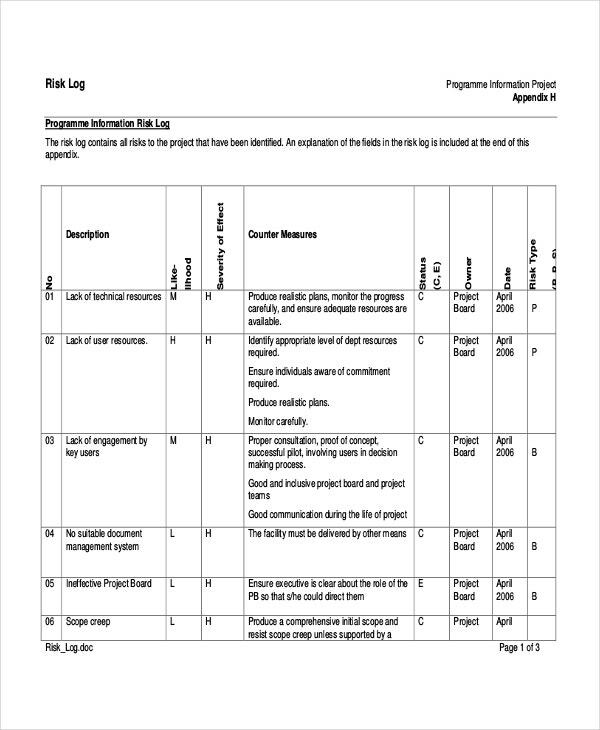 This document is a BCF Risk Log Template incorporating the details of each identified BCF risk along with the probability of its materialization. It also lists out the impact as well as the category of the risk. The mitigating actions find a clear mention along with the timeframe of its review. Agricultural land is also subject to environmental risk due to pollution, contaminants, natural calamities, and so on. 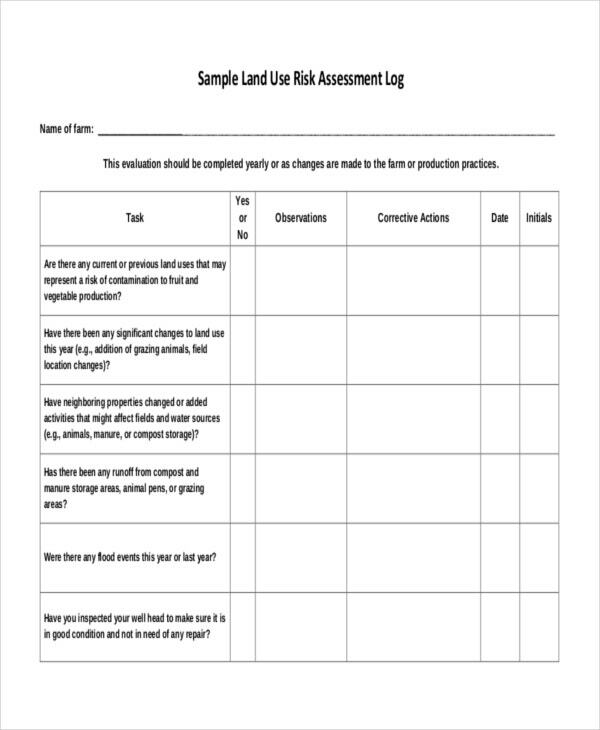 This document is a risk assessment log template for such risks involved in the use of agricultural land for production purposes. The document includes the observations as well as the corrective actions initiated. 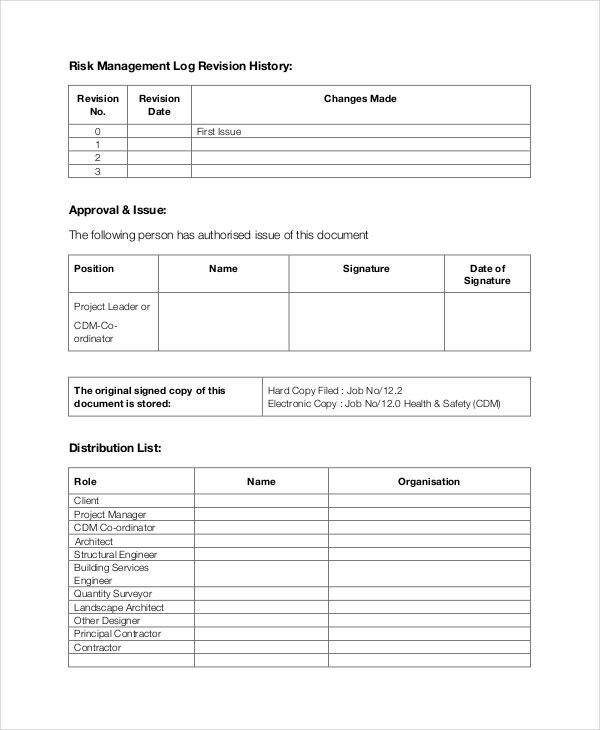 This document is a Risk and Issue Log template that enumerates the details of the risks involved in executing any project. It gives a description of each risk along with the probability of occurrence of the risk. It lists out the severity quotient and the effects. This document also contains the details of the materialization of the risks along with steps taken to solve the issues. 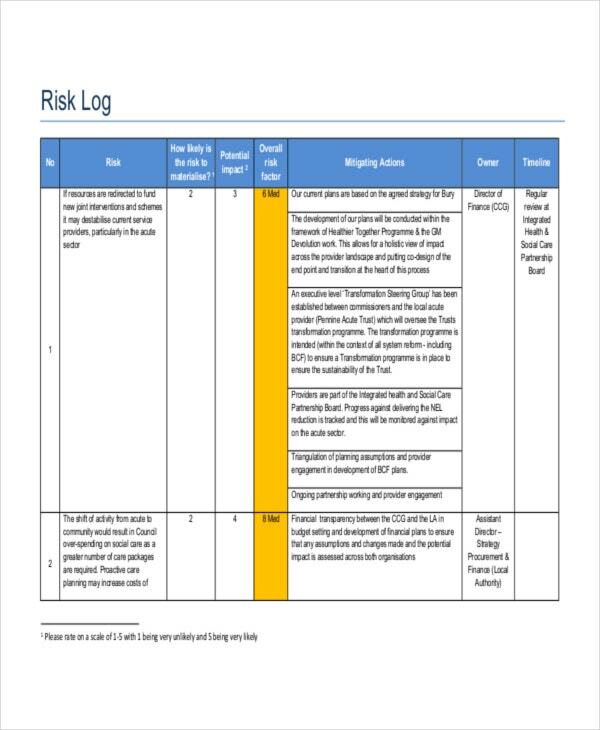 This Risk Log Template provides the details of all the identified risks in the implementation of a project. The template lists out the significance as well as the probability of the occurrence of the risk. The mitigation measures find a mention as well. > What is the Purpose of Identifying the Risks? Any project would have its own risks associated with it. In case you do not take remedial actions and precautions, it could affect the performance of the project. Hence, the first step is to identify the risks correctly. Once you do the identification, you would get an idea about the probability of its occurrence as well as the impact it could have on the project. Documenting the same is very important as it could serve as a record. Documentation would also assist you in finding out the correct measures to counter the risks. > What Steps Should one Take After Identification of the Risk? You have done half the work once you identify the risks correctly. The next step is to document the same and analyze the risks. A threadbare analysis of the same would enable you to find solutions for mitigating the risk. The best way to solve any risk is to avoid taking the same. You may also see Decision Log Templates. However, it would not be always possible. Hence, taking steps to mitigate the risk would be better to reduce the severity of the impact of the risk on its materialization. The analysis would also give you a clear idea about the probability of the materialization of the risk. > How do you Use the Template? The template is very user-friendly. You have the tables before you. You have to enter your data, as you perceive the same. The columns are self-explanatory. On filling up the columns, you would get a clear picture of what you need to do to mitigate the risks. This template would help you to analyze the risk in the proper perspective.The analysis is very important. If you do not know the severity of the impact of the risk, you would never be able to find the correct solution to mitigate the same. 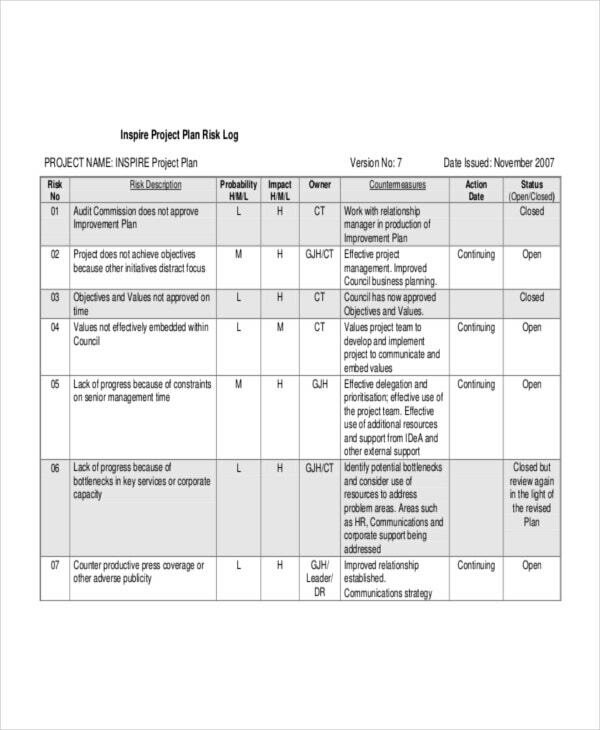 This Log Templates would be of great help to you in analyzing the same.